Director – Montgomery Tully, Dream Sequences Directed by David Paltenghi, Screenplay – Charles Eric Maine, Based on his Novel Escapement, Additional Material – J. McLaren-Ross, Producer – Alec C. Snowden, Photography (b&w) – Bert Mason, Dream Sequences Photographed by Teddy Catford, Music Supervisor – Richard Taylor, Electronic Music – Soundrama, Makeup – Jack Craig, Art Direction – Wilfred Arnold. Production Company – Merton Park. Insurance investigator Jeff Keenan heads to Cannes to assess a half-million dollar claim after movie star Claude Denver dies in a car crash. The investigation leads to the mysterious Amerson clinic where Denver and several others who have also recently been killed were patients. At the clinic, Keenan learns how psycho-neurologist Philip Maxwell has perfected a device that replays recorded images into the dreams of patients and can cure addictions and soothe disturbed minds. When Maxwell learns of the deaths, he tries to get clinic head Paul Zakon to shut the facility down. Instead, Zakon blackmails Maxwell into a scheme to program patients with nightmares and then ‘cure’ them with soothing dreams that feature Zakon as a benevolent figure and will lead them to sign their assets over to him. 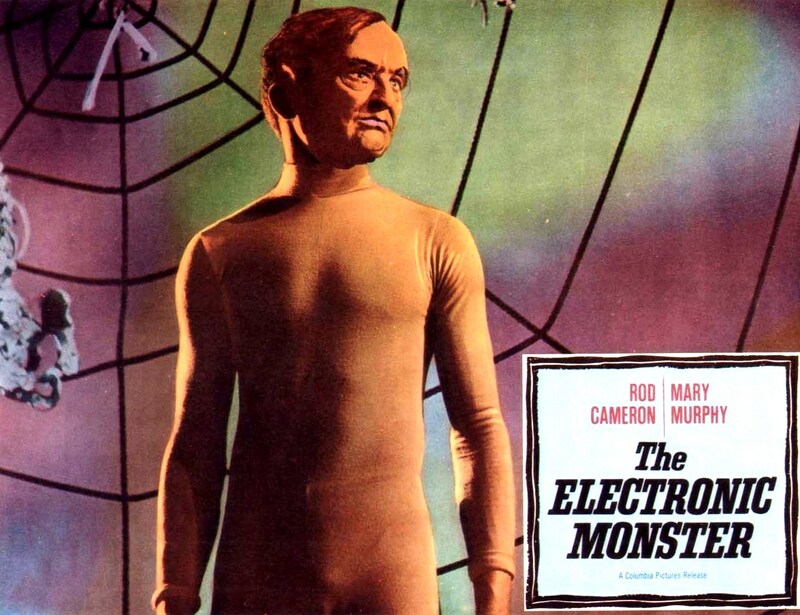 The Electronic Monster is a potentially interesting film written by Charles Eric Maine who was a minor British science-fiction author and screenwriter. Maine wrote and had had a number of other works adapted to film during this era – the Hammer film Spaceways (1953), Timeslip/The Atomic Man (1955) with the most well known being The Mind of Mr. Soames (1969). 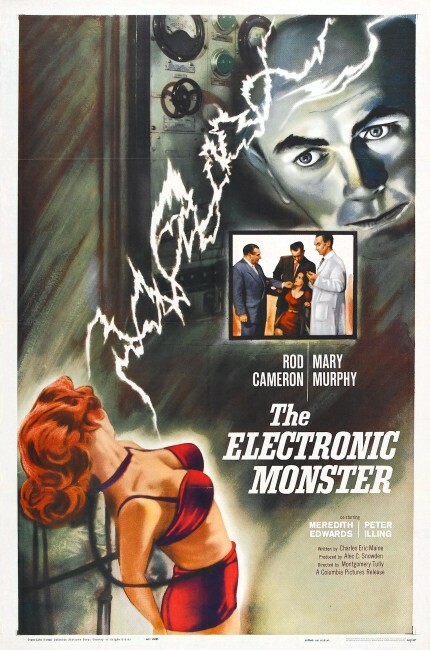 The premise of The Electronic Monster – that of people viewing/entering into others dreams – is similar to ideas that were handled more adventurously in subsequent films like Dreamscape (1984), The Cell (2000), Paprika (2006), Vanishing Waves (2012) and in particular in Christopher Nolan’s Inception (2010). However, as it transpires, the way the idea as handled here goes nowhere. The script is very talky. Everything is directed in a doggedly literal fashion by Montgomery Tully, a British thriller director who made two other mediocre ventures into science-fiction – Battle Beneath the Earth (1967) and The Terrornauts (1967). There is little action – most of the film takes place in drearily ordinary offices and the two punch-ups we get are so unconvincing that one spends more time laughing. The dream sequences are the most promising part about the film but the dull Greek ballets we are presented with seem to hold the most unexciting possibilities imaginable. Most disappointing is that we hardly get to see any but the briefest of these sequences, least of all anything of the horror sequences. The soundtrack wails with the blips and bonks of early experimental electronics. The film offers up stolid carved-in-granite Rod Cameron as the hero of the piece and he moves through the film like the proverbial brick shithouse in both build and locution. Thrown into the bargain comes a bevy of incredibly unconvincing French accents. One of the small pluses of the film is the nicely megalomaniac performance from Peter Illing as Zakon.